Stretching tapers are an excellent way to stretch your ears and a real essential for your ear stretching kit. But what are stretching tapers? 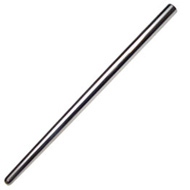 As you can see below, a stretching taper is a piece of jewellery that tapers at one end. The large end will be the size that you wish to stretch to. 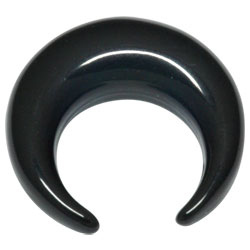 This allows you to slide the stretching taper through your piercing, gradually stretching the piercing. Once you have passed the taper through your piercing, you can remove it and insert an appropriately sized piece of jewellery, e.g. a flesh tunnel. Using a stretching taper is one of the easiest and safest way to increase your gauge, as well as one of the most comfortable. Using a stretching taper is safe and straightforward. However like all forms of body modification, it must be done carefully and safely to avoid damage to your piercing. I recommend that you ready my previous post How To Stretch Your Ears before you begin, because it outlines the best way to safely stretch your ears and avoid some of the most common problems. Whenever you stretch your ears, it is important to do so gradually and listen to your body. Stretching should not be painful, merely uncomfortable. If you experience sharp pain or bleeding, stop immediately. You may be stretching too quickly, or perhaps your piercing is not fully healed. Listen to your body and start again when you feel comfortable. That said, here is my method for using stretching tapers. Start with a clean taper and clean, healthy, fully healed piercing. The taper should be no more than 2mm larger than you current gauge. Lubricate both the piercing and taper with a natural oil e.g. olive, jojoba or vitamin E oil. Insert the end of the taper into the piercing and start sliding it through the piercing. There may be a stinging sensation but it should not be painful. Once the taper is pushed fully through your ear, align the end of a flesh plug with the big end of the taper, as if it were part of the taper. Then push both the taper and jewellery through your ear until the flesh plug is fully in your piercing. We have hundreds of different stretching tapers available but you can see my favourite stretching tapers below. 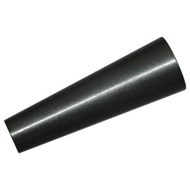 I recommend using steel tapers, as they are non-porous, non-irritating and easy to clean. 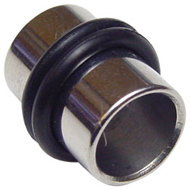 They are also cheap, which is important if you will need multiple sizes. This entry was posted in Body Piercing Education, How To Stretch Piercings, Stretched Piercings and tagged Ear Stretching, Ear Stretching Guide 101, Ear Stretching Jewellery, How To Stretch Your Ears, Stretching Taper Pins, Stretching Tapers on March 26, 2014 by Piercing Guru. Salt soaks are an easy and effective way to treat a sore or irritated ear stretching. A salt soak essentially consists of submerging your ear stretching in a warm salt solution. This cleanses the piercing and draws out any infection or pus, giving it the best possible chance of healing. Ear stretchings are easily irritated e.g. by stretching too quickly, by cheap jewellery or a grain of dirt getting between your skin and the jewellery. 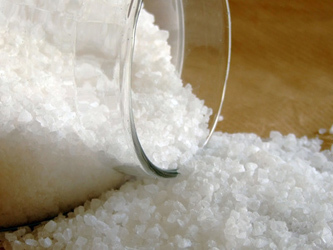 In most cases, a few salt soaks will calm the irritation and leave your ear feeling much better. If the irritation is serious I recommend downsizing temporarily, continuing salt soaks and consulting a professional piercer if it does not improve. Mix 1/4 teaspoon of salt with 250ml boiling water in a clean heat-resistant container such as a ceramic mug. Stir with a clean metal spoon until all the salt has dissolved. Allow to cool to a bearable temperature i.e. similar to a drinkable cup of tea. Fill a clean shot glass (or similar container) to the brim with the salt solution. Submerge your ear stretching in the solution for 5 to 10 minutes, or until it cools. Rinse with cold water to remove any residue. If there is a lot of lymph etc. use a clean cotton bud, taking care not to leave any fibres behind. Step four is optional, but personally I find it easier to submerge my whole stretching in a small, full container like a shot glass as opposed to a mug. Salt soaks are great for any sore piercing, but you may have to get creative in order to submerge your piercing in the salt solution! This entry was posted in Body Piercing Aftercare, Body Piercing Education, How To Stretch Piercings, Stretched Piercings and tagged Ear Piercing Aftercare, Ear Stretching, Ear Stretching Guide 101, How To Care For Body Piercings, How To Stretch Your Ears, Piercing Aftercare, Stretched Ear, Stretched Ears on November 6, 2013 by Piercing Guru. When you stretch your ears, the most important things that you can do are a) stretch slowly and b) use high quality ear stretching kit. 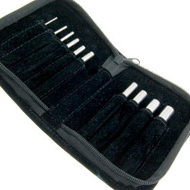 High quality stretching tools give you the best chance of a healthy stretching process and a good end result. This is because good quality tools will be made of biocompatible, lightweight materials that do not cause irritation or put undue pressure on the piercing. In this post I will outline the ear stretching kit that is not only my personal favourite, but is recommend by the majority of piercers and experienced stretchers. For actually stretching your ears, I highly recommend surgical steel stretching tapers. 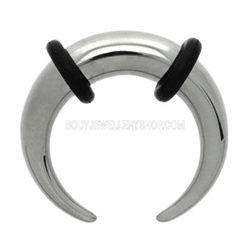 Here at Body Jewellery Shop you can buy these tapers individually or as a kit, as you can see below. High quality steel stretching tapers such as ours are finely machined with a perfectly smooth surface and will not irritate your ears. If you choose cheaper acrylic tapers, you may find that they irritate your ears and drag on the skin. Lubricant is also essential – either jojoba, Vitamin E, olive, hemp or almond oil. These natural oils reduce drag and pain during stretching. They also condition the skin and should be used to massage the earlobe both before stretching and during the healing process. 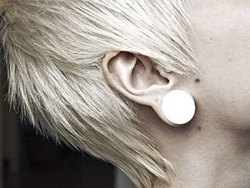 After you have stretched your ear, remove the taper and insert an unflared flesh tunnel. My favourites are the steel flesh tunnels below. You should never leave the taper in, as this leads to uneven stretching and puts pressure on the new stretching. You should always use non-porous materials for your first post-stretching jewellery to encourage clean healing: either surgical steel or titanium. 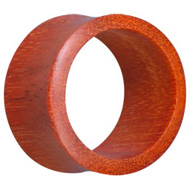 Once your ear stretching has healed completely and you have reached your desired gauge, I recommend wearing wooden flesh tunnels or plugs. Wooden jewellery is completely non-irritating, lightweight and very comfortable to wear. It reduces odour and stays the same temperature as your body. My own wooden tunnels have kept my ears happy for years and I find that they require less cleaning compared to metal jewellery. So there you have it, my favourite ear stretching kit! This entry was posted in Body Piercing Education, How To Stretch Piercings, Stretched Piercings, Stretching Jewellery and tagged Body Piercing Tapers, Ear Stretching, Ear Stretching Guide 101, How To Stretch Your Ears, Stretched Ear, Stretching Jewellery, Stretching Taper Pins, Stretching Tapers, Stretching Tools, Taper Pins, Tapers on October 22, 2013 by Piercing Guru. Stretching your ears can be done safely if you know how, but as with any body modification, there are risks involved. Some ear stretching risks are reversible but they can lead to scarring and permanent damage to your earlobes. Thankfully, most of these risks can be avoided through careful stretching and doing you research before you start stretching your ears. In this post I will explain three of the most common ear stretching risks, how to avoid them and what to do if they happen to you. As with any piercing problem, consult a professional piercer if you are at all unsure or experience other problems while stretching your ears. 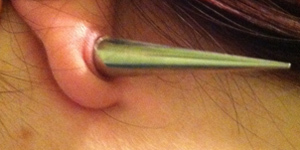 A blow-out occurs when you stretch a piercing too quickly. This puts too much pressure on the fistula (the hole formed by the piercing) and force part of the fistula out the back of the piercing. This creates a lip or flap of skin at the back of the piercing. The image on the right shows a mild blow-out, but they can be much larger. Ear stretching blow-outs look terrible and larger ones can be uncomfortable or even painful. The best way to avoid a blow-out is to listen to your body, massage with jojoba oil before stretching and allow at least two weeks healing time in between stretching. If you get a blow-out, downsize your jewellery immediately – this can prevent the ear healing in its blown-out shape. I also recommend massaging the earlobe with jojoba oil daily to soften the tissue. Do not stretch further until it is completely healed. Some people find that their blow-outs reabsorb, but in some cases they will never fully disappear. Uneven stretching means that the outside of your stretching becomes thinner in one area. It is caused by stretching too quickly or by stretching with weights. As well as looking odd, extreme thinning can lead to a split earlobe. A split earlobe can only be repaired through surgery, but if you catch the thinning early enough it is reversible. If you notice any unevenness or thinning, downsize by at least 2mm and massage daily with jojoba or Vitamin E oil. It is important to use lightweight jewellery, so that no weight is put on the thin areas. Allow the stretching to shrink and heal for at least 2 weeks before restretching gradually with lightweight jewellery. This process should thicken the tissue and help to even it out. 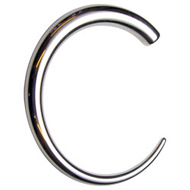 Stretching too quickly or without lubrication can lead to tears around the circumference of the piercing, as shown here. Tears are painful and can lead to thick scar tissue that makes it harder to stretch further. They can be avoided by stretching slowly with a lubricant such as jojoba oil. It is also important to use high quality steel tapers and stop stretching if you feel a sharp pain. If your earlobe tears while stretching, immediately downsize to significantly smaller, lightweight jewellery. This removes pressure on the wound and prevents a subsequent blow-out. Allow it to heal completely before stretching again. This entry was posted in Body Piercing Education, Body Piercing Problems, How To Stretch Piercings, Stretched Piercings and tagged Body Piercing Risks, Ear Stretching, Ear Stretching Blow Out, Ear Stretching Guide 101, Ear Stretching Risks, How To Stretch Your Ears, Piercing Blow Out, Stretched Ear, Stretched Ear Piercing, Stretched Ears, Stretching on October 9, 2013 by Piercing Guru.